The Unwritten Rule, Elizabeth Scott (210 pages) – The unwritten rule is of course don’t fancy your best friend’s boyfriend (a theme from the last batch of new books). This time, Sarah’s doing a pretty good job of avoiding Ryan (being Brianna’s boyfriend), until they’re “thrown together” one night. The first sentence sums it up. First sentence: I liked him first, but it doesn’t matter. First sentence: The summer before D Foster’s real mama came and took her away, Tupac wasn’t dead yet. Stuck on Earth, David Klass (227 pages) – Ketchvar III comes to Earth in order to answer the following question: “Should the Sandovinians release the Gagnerian Death Ray and erase the human species for good?” In order to do this (answer the question, not erase the species) he inhabits the brain of Tom Filber, the geekiest geek, ironically almost an alien himself, so geeky is he. Needless to say, Ketchvar becomes quite involved in Tom’s life, which may well be a good thing for Earth. First sentence: We are skimming over the New Jersey countryside in full search mode, hunting a fourteen-year-old. Split, Swati Avasthi (280 pages) – Jace Witherspoon has escaped his abusive home and gone to live with his brother. “A riveting portrait of what happens after,” the cover says. First sentence: Now I have to start lying. First sentence: It was a hot summer day in Cousins. Shooting Star, Frederick McKissack Jr (273 pages) – Jomo Rodgers is a very good (American) football player, on the varsity team at school etc. He feels the pressure to be more than very good, cranks up the training and finds himself dealing with the question, to use steroids or not? First sentence: Breathing is a natural process, yet Jomo Rodgers found himself flat on his back trying to remember how to do it. Broken Memory, Elisabeth Combres (132 pages) – Emma’s mother is murdered by the Tutsis, and Emma (a Tutsi) is taken in by an old Hutu woman and brought up in her home, gradually coming to terms with her terrible past. A story inspired by the genocide in Rwanda. First sentence: They are there. Headgames, Casey Lever (282 pages) – Steven Byrd learns the hard way that girls who think you’re a waste of space and who then invite you to be a part of their secret game are probably up to no good. “Everyone has secrets. But who will be the first to crack?” asks the cover. First line(s): Bell. Ancient History. Ms Landers was away on Year 9 camp, so the class had been off-loaded onto the Resource Centre. Lockdown, Alexander Gordon Smith (273 pages) – The first in the Escape from Furnace series. Furnace is a maximum security prison, a mile under the earth’s surface. When Alex Sawyer is convicted of a murder he didn’t commit he is sent there, and realises quickly he must escape or face a life worse than death. First sentence: If I stopped running I was dead. No and Me, Delphine de Vigan (246 pages) – Lou lives in a quietly disfunctional family, where her father is barely holding up and her mother hasn’t left their appartment for years. She meets No, a homeless girl, and invites her to live with them. A novel about ” the true nature of home and homelessness”. Daywards, Anthony Eaton (3341 pages) – Book three in the Darklands trilogy. Dara, Jaran, Eyna and their family must leave their home when the ghosts of a dead civilisation return to haunt them. First sentence: The day Da Janil died, Dara had expected to be let off hunting duty. The Summer I Got a Life, Mark Fink (195 pages) – Andy and Brad are brothers who don’t exactly get along. When their Hawaii holiday turns into time on their uncle and aunt’s farm in Wisconsin things might seem to be distinctly average, but then Andy meets Laura, who is amazing, and all things considered the summer might end up being not so terrible. First sentence: I was totally pumped! 27.05.10 | Permalink | Comments Off on O.S.T. Closes Soon! That’s right, there are only a few more days left for you to enter the O.S.T. Competition, for it closes on the 31st of May. Remember you can enter either by commenting on this blog, or by filling out an entry form in any of our branch libraries. Thank you to everyone who has already entered, we’ve enjoyed reading your playlists! Here’s a fun fact about Dionne Bromfield; Amy Winehouse is her godmother. Other facts include her being only just old enough to have a YA card when she signed her first record deal (13), her album, Introducing Dionne Bromfield reached number 43 in the UK charts and is now in our collection. Get it if you like the neo-soul. John Mayer continues to ride on the adult-alternative train with studio album number five, Battle Studies. Just based on the title and track names such as Heartbreak Warfare, Assassin and War Of My Life, I’d say it’s a Love Is A Battlefield themed concept album. I guess those high profile break-ups combined with Pat Benatar are good for the creativity. Daft Punk’s Musique Vol. 1: 1993-2005 is a collection of the robotic duo’s singles and most bangerific moments. As the French pair are responsible for some of the highest high points electro has ever reached, it’s a fantastic album. Do yourself a favour and youtube some of their videos, unless of course you don’t enjoy anime, dancing mummies and robots shredding on guitars. James Murphy’s LCD Soundsystem are another band responsible for some great electro. Their 2007 release Sound Of Silver was (rightly) trumpeted by critics as one of the best of the year and pitchfork.com named All My Friends number two song of the decade. More importantly (?) it gets the Synthesiser Patel seal of approval. Runaway, Meg Cabot (an Airhead novel, 310 pages) – in which Em is on the run, discovers Nikki’s secret and turns to Will Christopher for help (even if this means Stark Enterprises might try to kill him as well as her). An Off Year, Claire Zulkey (213 pages) – Instead of starting her first year at college, Cecily decides to take a gap year to find out what she wants to do with her life. A tall order! First sentence: I raised the key and hesitated. Scarlett Fever, Maureen Johnson (332 pages) – Scarlett’s family has money strife, so she’s working as an assistant to a Broadway star while still at school, wishing her ex boyfriend would contact her, being a bit disturbed by her lab partner Max (wonder where that’s going), and being stressed out by various members of her family. First sentence: It was four thirty in the morning, and Scarlett wanted answers. First sentence: Everyone has secrets. First sentence: I never meant for it to happen like this. Getting Revenge on Lauren Wood, Eileen Cook (261 pages) – Just before high school Lauren completely humiliated Helen, so badly that Helen had to move to another town. Lauren’s been gliding through high school as Ms Popular since then, but one suspects – based on the title – that she is going to get her comeuppance. First sentence: Last night I dreamed I dissected Lauren Wood in Earth Sciences class. Forget-Her-Nots, Amy Brecount White (365 pages) – Laurel can do things using flowers. Her mother meant to tell her what this means before she died, and she seems to have left her clues as to what her power means, but can Laurel learn about it, what it means, and how to control it, before things go off the rails (quite possibly at prom)? First sentence: Lily reread the letter to her daughter and signed her name at the bottom. Life Swap, Abby McDonald (303 pages) – Tasha, from Santa Barbara, and Emily, from Oxford University, swap places for a semester. Sounds great, but their new lives mean they must message each other regularly for advice. First sentence: This is so not a good idea. (Not the rugby one, but the real football one.) Awesome! The All Whites will be playing the Australian Soccoroos on the 24th in Melbourne (kick-off is at 9.30pm NZST) and five days later they’re up against Serbia. Exciting! To whet your appetite do watch this. The CDs, They Keep On Coming! 22.05.10 | Permalink | Comments Off on The CDs, They Keep On Coming! Here are the latest CDs to arrive in the YA collection. There have been a lot lately, but there’s even more on the way if you can believe it. First up is Glee : the music : the power of Madonna. This features Glee cast members singing Madonna songs, as if you couldn’t guess from the very informative title. It’s the soundtrack to the fifteenth episode of Glee, which hasn’t aired in New Zealand yet, which means it’s kind of a sneak preview. Listen to the future! Sort of. Twilight : music from the original motion picture soundtrack has been deluxe-ified with the addition of a DVD and some bonus tracks. Alongside the original hits from Paramore, Muse, Iron and Wine and the rest are remixes, live versions, acoustic re-workings, interviews, videos and all that sort of jazz. One of the interviews is with Hayley Williams from Paramore, making it a must have for Paramore fans and Twi-hards alike. British electro-pop starlet Ellie Goulding released debut, Lights, last year to positive reviews after becoming a hit in the blogosphere. Imagine the middle ground between Florence and the Machine and something more poppy, like say, Atomic Kitten and you’ll be right about on the money. If that sounds like a cup of tea you’d enjoy a sip of, you know what to do, issue it obvs. Taylor Swift’s Fearless has also be given a deluxe-ing and the result is Fearless : platinum edition. Now it includes previously unissued tracks + DVD with music videos, behind-the-scenes footage, photo gallery and awards footage. No word on whether the awards footage includes a bonus interrupting Kanye West. Though it would be an absolute travesty if it didn’t. There’s quite a few extras anyway, so probably worth a look-see if you enjoyed it the first time around. The Phoenix Foundation’s latest, Buffalo, is here. It’s a continuation of the freak folk/alt-country/pop stylings they’ve been crafting for over a decade now. They’re from Wellington and it’s still New Zealand Music Month for a week or so, which means you should support them by issuing their albums, they’re good. Former Guns ‘n’ Roses (back when they were awesome) guitarist, Slash, has an album out called Slash. It’s not quite a solo album because every song features at least one of a cast of extremely varied guest vocalists. Which hopefully means there is something for everyone, examples: Ozzy Osbourne, Fergie, Chris Cornell, Adam Levine, Dave Grohl, Kid Rock and Iggy Pop. Quite a mix, huh? Hang on to your hats, there’s a lot of suspense and horror in here, including a fair amount of creepy New Zealand novels. Radiant Shadows, Melissa Marr (340 pages) – the second to last instalment in the Wicked Lovely series focuses on Devlin – the High Court’s assassin – Ani – Gabriel’s halfling daughter – and Rea – an incorporeal human who can animate bodies and manipulate dreams. Much shocking stuff happens, several past characters are back (Seth, Irial, Niall), several past characters are absent (Ash, Keenan, Donia), and it all looks like it’s heading for a big showdown. First sentence: Devlin stood immobile as the spectral girl approached. Twilight: The Graphic Novel, Stephenie Meyer, art and adaptation by Young Kim. The much talked about graphic novel of the much more talked about novel. Good or bad? Read it and tell us what you think. First sentence: I’d never given much thought to how I would die – though I’d had reason enough in the last few months. The Sight, Judy Blundell (writing as Jude Watson, 202 pages) – The Sight is two novels in one, Premonitions and Disappearance. Gracie has premonitions and when her friend Emily disappears she is forced to use them to try and uncover what has happened. First sentence: I think I was a nice person before my mom died. White Cat, Holly Black (310 pages) – Cassel is the ungifted member of a family of “curseworkers”, but then he starts dreaming of a white cat who wants to communicate with him, and other strange, disturbing things happen. The cover says it’s “a gripping tale of mobsters and dark magic”. First sentence: I wake up barefoot, standing on cold slate tiles. First sentence: I opened my eyes. The Limping Man, Maurice Gee (176 pages) – the final book in the series that began with the award winning Salt. “What is the source of the Limping Man’s monstrous power?” This is the question Hana and Ben must find the answer to in order to defeat the Limping Man before his power become all consuming. First sentence: Hana ran through the broken streets of Blood Burrow. First sentence: I didn’t go to Alice’s funeral. First sentence: There were rumours. The Taniwha’s Tear, David Hair (357 pages) – the sequel to The Bone Tiki. Puarata’s warlocks are fighting a war in mythical Aotearoa that is threatening to spill into the real world. Matiu has promised to help the taniwha who, it is hoped, is the key to stopping this happening, but can anyone be trusted? First sentence: Christmas on the beach had been a Douglas family tradition since before Matiu was born. Darke Academy: Blood Ties, Gabriella Poole (288 pages) – the Darke Academy is in New York and Cassie is coming to terms with her powers, then “an old enemy returns”… Perhaps the person on the cover with the glowing red eyes and the manly, furrowed brow? Ebony Hill, Anna McKenzie (223 pages) – the sequel to The Sea-wreck Stranger. Ness and Ronan are on opposite sides of a battle of survival between two communities, Vidya and Ebony Hill. First sentence: From above the gardens that stride in wide stairs up the hillside, I look out over the wreckage of a world I’ll never know. Monster Republic, Ben Horton (279 pages) – “An explosion in a nuclear power plant. Kids patched up with scavenged body parts and bionic implants. A growing army of superhuman soldiers programmed for destruction. Cameron Riley is about to discover that what doesn’t kill you makes you stronger…” (Back cover). Looks good for people who aren’t big fans of reading. First sentence: Even though it was well past midnight when the phone call came, Dr Lazarus Fry answered it before the second ring. The 2010 New Zealand Post Children’s Book Award, Young Adult Fiction Category winner is The Crossing by Mandy Hager (The first in the Blood of the Lamb trilogy). Congratulations! The NZPCBA page for the book is here, and if you’re keen you can also read the second in the trilogy, Into the Wilderness. A lot of people submit book reviews through the library’s website. A lot! 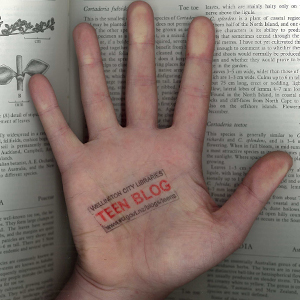 Many reviewers are very enthusiastic readers of teen lit. Here’s a bunch of them, pretty much unedited for authenticity.